Mother’s day is a great opportunity to show the wonderful moms in your life how much you care with a gift or a gesture. Your mother may have been the biggest influence you have ever had or she may have been just there for you in thick and thin. She took care of you and taught you what you know in those early years of your life. 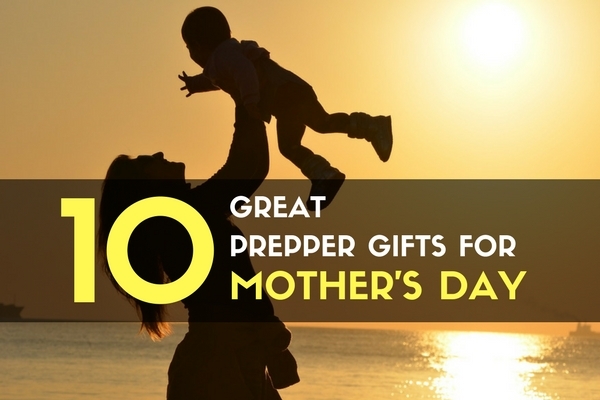 Many prepping skills have been passed through the generations by moms. Whether you learned home skills such as canning and cooking, or got dirty with some gardening and hunting, the lessons you learned from your mother have stuck. If you are married to a mom, you can see this from a different perspective as she interacts with the kids. Moms deserve appreciation, whether it’s the mother that brought you into this world or the woman raising your children. Mother’s Day is the one day that special mom in your life your appreciation for everything she has done. Although she deserves to be appreciated every day, a single token, gesture, or spending time with her on Mother’s Day can tell her a lot about how you feel. It is coming up soon this year, with Mother’s Day falling on May 14. 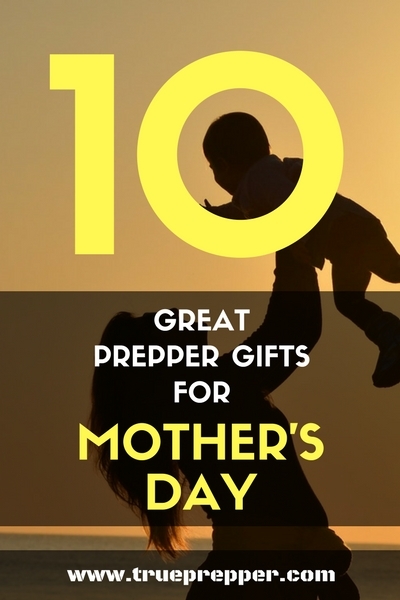 If the mother in your life is an avid prepper, homesteader, or just appreciates being prepared; check out the gift ideas below. We list the gifts in order of cost, so you can get the best gift for your loving mom and for your budget. Whether you read for motivation, education, or relaxation- there are plenty of good prepper books out there. If she hasn’t read it yet, we would suggest One Second After. It is a great work of prepper fiction and has inspired many to take to preparedness with a renewed vigor. Not much is as versatile as a bandana. One way to improve on a bandana is to add a little information to it. With almost twenty options to choose from, you can find something that she likes and that could help her out in a disaster situation. First aid info, general nature guides, even a hummingbird chart- score a unique bandana for the special mother in your life. If your special mom is at all into canning, or even curious- she is in need of supplies. Lids especially get used up quick, but anything that helps with her productive hobby is a sure bet as a good gift. These things are incredibly useful. Whether they are adding some flair to your garden or providing light in an emergency, they are cheap and practical. As long as they get sunshine during the day, they are basically tea candles at night. Tea candles that last much, much longer. It is my opinion that you can’t have enough of these things- especially at this price. You can probably find them even cheaper at your local hardware store. The functionality and versatility of a swiss army knife just can’t be beat. Except by maybe a multitool. But a swiss army knife is the smaller original version of a multitool that can get the job done without weighing down a purse. The Classic SD is a great option, and available in an amazing number of styles. Pick out the one best for mom, whether it is pink, florals, or just the classic red. Powers out? Electric coffee maker not working? A French press can come to the rescue. With boiled water, you can still get your coffee fix. This is a great gift for the coffee lover. As with most basic kitchen utensils, you can get them in a variety of styles and quality. We picked our favorite which also happens to be the highest reviewed. The French don’t get much right, but they figured out how to make some great coffee- even without electricity. I won’t pretend to know fashion from a bag I pull out of the trash, but RFID protection is important in modern society. You can get the RFID Blocking sleeves for free at most banks, but that’s just an extra hassle having to remove the sleeve every time you use the card. A RFID blocking wallet eliminates this hassle and still keeps you relatively safe. When picking one out, make sure you pick a wallet that fits mom’s fashion sensibility- or include a gift receipt! A fireproof pouch gives your mom a great way to protect her valuables and photos that don’t need to take up room in a safe. To add a personalized touch, stuff a picture of the two of you together inside and you have the perfect Mother’s Day gift. While it is functional, you also can talk about how it symbolizes that you are there for her in the worst of times! Having the special mom in your life be safe is probably a priority for you. Hit two birds with one stone by taking a concealed carry class together. If you need a permit as well, you could get one easily and spend a little quality time sending some rounds downrange with mom. If you already have a permit, it is still a great opportunity to hang out and teach your mother a thing or two about firearms and safety. Classes run around $100 where I live, if you bring your own pistol and ammo. If you borrow, it can run about $150. If you are unfamiliar with your local firearms store, check out ccwclasses.com to find a class near you. Being able to garden indoors is a game changer. This all-in-one solution makes it easy. If you are looking to grow more than just herbs, you may want to consider a full hydroponic system. Either way, the Miracle Grow AeroGarden makes a great gift to get started growing herbs where herbs normally wouldn’t want to grow! The best thing you can give your mom for mother’s day is a little time. Call her up and let her know that you are thinking of her. Stop by her house and catch up on all the little things. Take a moment to reminisce with her and just pause to enjoy hanging out with her. Make Mother’s Day special for all the mothers in your life. Keep exploring, stay prepared, and be safe.